Pit Bulls have a reputation for being aggressive or dangerous dogs; this bad reputation comes –in no small part- from their association with blood sports such as dog fighting. It’s true that Pit Bulls are selectively bred to grow very strong, and have an exceptionally strong bite force, however, as with any dog, their temperament and behavior is largely based on the environment in which they are raised. A well raised, healthy and properly disciplined Pit Bull poses no more of a threat to the public than any other dog. 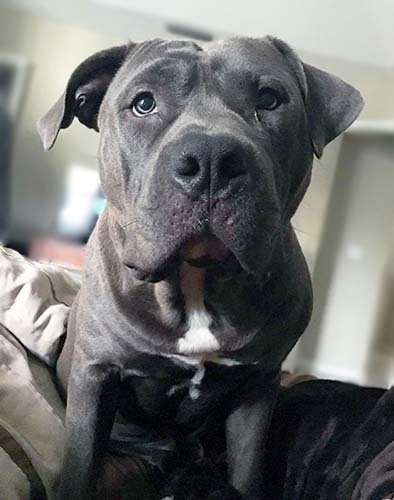 In recent years, Blue Nose Pitbulls have soared in popularity for their beautiful coloration which can range from a dark charcoal gray to a light silvery color. This is due to a recessive gene present in both parents which causes a dilution in the black pigmentation (called ‘Eumelanin’), which leads to this beautifully unique shade. This guide will give you some facts for prospective Blue Nose Pitbull owners, and will help you to make an informed decision about where to look when buying a Blue Nose Pitbull. What causes the ‘Blue Nose’ in Pitbull? 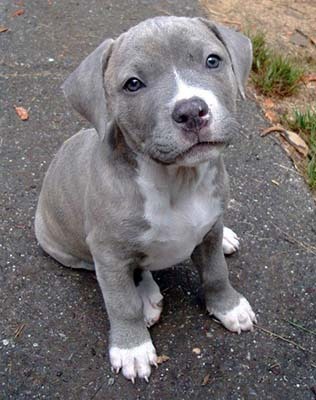 The Blue Nose Bully, contrary to popular belief is not a different species of Pit bull, but rather one possessing a recessive gene, which causes the coloration (the light gray color referred to as ‘Blue’ in dog-breeding circles) to be expressed in this way. In order for a recessive gene to be expressed, the parents must both possess the recessive gene. This means that Blue Nose Pitbulls are often selectively bred from a small gene pool, and can exhibit behavioural and health problems (most commonly, skin diseases) such as mange, hot spots, and alopecia; however, these are easily treated and can be prevented (or the effects minimalized) through good care and diligence. Can a Blue Nose Pitbull Parents have a Red Nose Offspring? Most likely not. Blue Nose Pitbulls are defined by the low levels of melanin (black skin pigment), which gives them their unique coat and skin color, caused by a recessive gene coming from both parents. Meaning, both parents possess this same recessive gene, and hence they cannot likely have an offspring with red noses. Do Blue Nose Pitbulls have Behavioral Problems? No. But as with any dog, there are certain provisions that you must make in order to ensure that they remain emotionally and psychologically healthy. With Pit bulls, the most important thing is exercise. Make sure that you can walk your Pit bull every day for at least an hour. Give them the opportunity to get off the leash and run around; a large park is ideal. Ensuring your Pit bull gets enough exercise is crucial in to be certain that they do not become bored, overweight or frustrated. 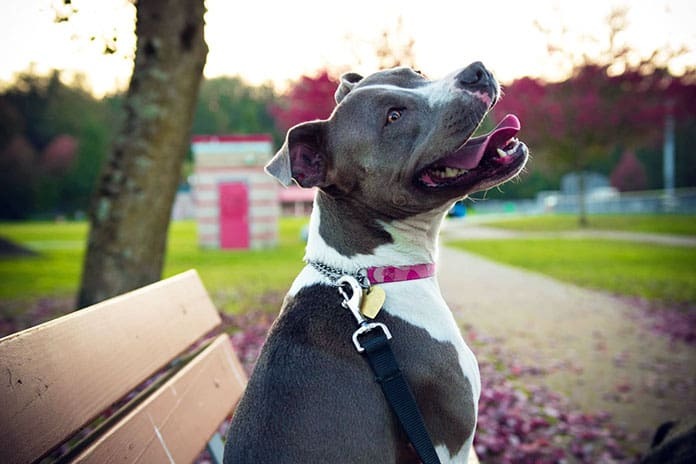 A lack of exercise may cause your Pit bull to start acting out; this could involve destructive or aggressive behavior, towards people or property. 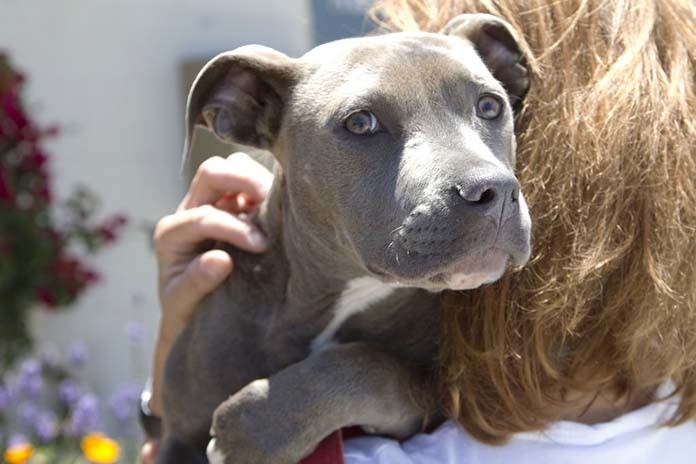 Pit bulls are very emotionally invested and sensitive dogs; this can be a double-edged sword. On the plus side, it means that they can be incredibly playful and loving if treated well from a young age, the downside is that if they are treated badly early on, it can be very difficult to win their affections later on, or change their behavioral patterns later in life. Blue Nose Pitbulls are also highly intelligent and highly intuitive, this means they can be trained quickly and learn some of the more challenging or complex tricks with the right training. If you intend to train your Pit bull, make sure you are either properly qualified to train them, or you hire the services of a proper dog trainer to ensure that they get the best training available. Pit bulls tend to be sociable with other dogs when raised around them (or given regular walks where they can interact with other dogs). Mature Pit bulls that have not socialized much with other dogs are likely to be less sociable; however, they are unlikely to be aggressive if raised properly. It’s recommended that –if buying/adopting a mature Pit bull​– you find out about the dog’s history to see if it’s sociable around other dogs (especially if it will be sharing a home with other dogs/animals). This particular dog breed is also known to prefer human contact and affection from humans over other animals, and other dogs. That’s not to say that they aren’t capable of being social with other dogs and animals, but it is important to develop that relationship at an early age. It is said that Blue Nose Pitbulls prefer human contact because of their empathetic and emotional nature, so it’s very important to give your dog lots of TLC (Tender Loving Care). Despite popular belief, this breed of dog loves attention and cuddles just as much as any other dog breed. As with most dog breeds, it is important to start training at an early age and develop a strong bond and relationship with your Blue Nose Pitbull pup, especially since this breed of dog can be rather stubborn. These dogs, particularly as puppies, are known to be incredibly playful—so it can help to have plenty of toys around the house and lots of play time to help use up some of that energy. 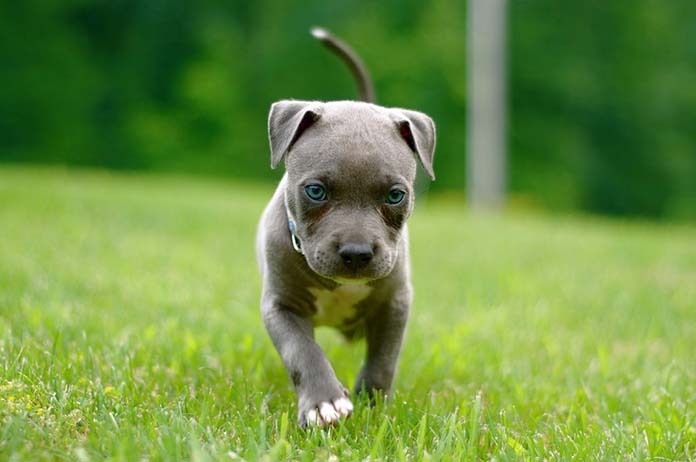 It can also be extremely helpful to get your Blue Nose Pitbull pup used to walk on a lead at an early age, even if they’re just strolling around the house. Physical activity is vital for them since they have such high energy levels, and (much like other breeds of dogs) tend to get restless and ‘act out,’ such as, dig holes in the yard or chew on something when they aren’t exerting enough energy or properly trained. As Blue Nose Pitbulls grow older, it can be more difficult to train them as they may have already fallen into bad habits, but of course, keeping their energy levels reduced can help. This can be achieved by walking with them, jogging, or even taking them for a swim (since this breed typically likes to play in the water as well). In terms of training, these dogs are known to be incredibly smart and social creatures, so as long as they are trained (preferably at a young age) and get enough physical activity and attention, then your Blue Nose Pitbull should really thrive in life. There are also puppy schools that can assist in training, however, it is important to develop that exchange and relationship with your dog as well (to practice what they teach at puppy school at home too). 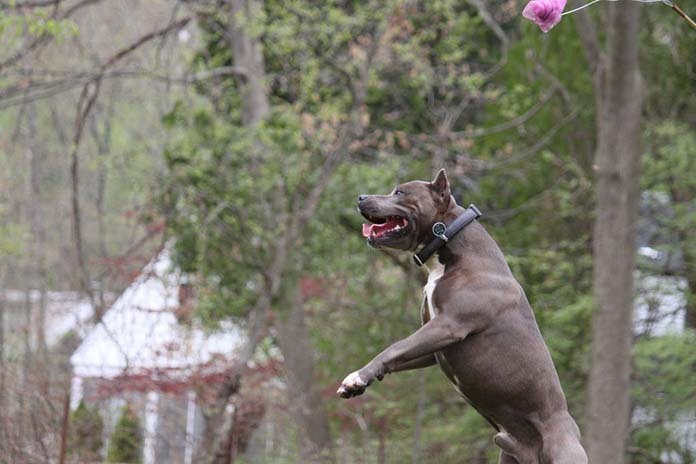 Pit bulls also tend to jump – and quite high too! It’s strongly recommended that you have a high fence surrounding the perimeter of your property, as they can be known to jump up to 6 foot high. ​Since this breed of dog is known for its high energy levels, and usually very active, it is important to bath your Blue Nose Pitbull regularly, especially if they are playing in dirt or smell bad. It is not only important to bath your pit bull, but also to make sure you’re grooming them regularly—this will also reduce excess shedding around the house. Though how often you should bath your ​dog does vary, it is recommended to bath them about once a month. This should be done in warm water (similar to how you would bath a newborn baby), and with the proper dog shampoo since soaps and human products can irritate the dog’s skin and dry out the natural oils in their fur. It is also important to take care of your dog’s ears, as they can get dirty too, which can lead to ear problems or infections. It is recommended to buy the appropriate ear care wipes and gently wipe the inside of your dog’s ears. Since they can be sensitive, it is vital that you follow the directions on the ear care wipe’s packaging and be very delicate when cleaning your dog’s ears. Do not use earbuds or poke into their ear canal, as that can be damaging to your dog’s hearing. Much like humans, it is also crucial to take care of your​ bully’s teeth. You can do this by purchasing special dental products for your dog, as well as giving them a balanced diet of dry and wet food. Additionally, it is important to try and introduce bathing, grooming, and ear and dental care at a young age to reduce your blue pits anxiety and perhaps give them a reward and/or treat afterward. Since the Blue Nose Pitbull is known for its sensitive and emotional nature (as mentioned prior), it is important to be calm and not stress when bathing your dog, as they will pick up on that and start to fret. Try and make bath time a fun and playful experience if possible. ​Once your pup is old enough and ready for solid food, it is suggested that they eat softened dry food. You can achieve this by dabbing a bit of water on the dry food pellets, in order to make them softer to chew. When your pup is fully weaned, you may feed them 2-3 times a day (depending on their body weight), as that is optimal for growth. It is also crucial to use high-quality vet approved dog food, with a mix of wet and dry food for healthy teeth and bones. ​Considering this breed’s high-energy personality and typical muscle mass, it is critical to feed your ​Pit bull a balanced high-protein diet. This includes various types of high-quality meat products. Many dog owners prefer store bought canned food, which is fine, but it is highly suggested to avoid grain, potatoes and corn-based foods as these are common allergens for many breeds of dog—particularly Blue Nose Pitbull’s who are prone to coat and skin problems. It is also highly suggested that you purchase high-quality meat, opting for the more expensive vet approved brands, and avoid fillers in canned food. Should you decide to create homemade food for your Blue Nose Pitbull it is important ​to only feed them 2-4 percent of their body weight on a daily basis. Obese Pit bull should only be fed once daily, but usually, you may feed your dog twice a day (morning and night). If you can stick to a routine that would be advised to aid digestion. Blue Nose Pitbull tend to come from a limited gene pool; this comes from breeders using the same dogs to create offspring within the same families, in order to produce dogs with low melanin levels. This means that Blue Nose Pitbulls have a higher propensity to suffer from diseases, allergies or skin conditions. The most common problem Blue Nose Pits tend to suffer from is Canine Scabies (more commonly known as Mange), and other skin conditions such as hot spots and alopecia (baldness). It’s important to check your Pit Bull regularly for redness, sores, bumps, baldness or scratching, and take them to the veterinarian for regular checkups. ​If your Pitbull is already suffering from Mange and you want to opt for something more natural, here​ are some effective home remedies for ​mange in dogs. Other issues that they may suffer from include grass allergies, deafness, poor vision, heart disease, and cataracts. Don't worry, though, with regular checkups, a healthy diet, proper sanitation and plenty of exercises; your Blue Nose Pitbull can live a long and healthy life. ​Like all dog’s it is important that they seek appropriate vet care, such as standard health care checks, along with flea and heartworm treatment on a regular basis. If you notice any strange abnormalities in your ​pit bull's behavior, such as, not eating or being less active, it is vital that you seek professional care immediately. Blue Nose Pitbull as Guard Dog? Pitbulls are not generally recommended as guard dogs. Their temperament, when raised correctly in a loving environment, means that they are quite sociable animals, and will only tend to attack an intruder when it harms their owner. As guard dogs, they are not the best, although they may deter some based on the reputation they have as dangerous dogs. If you’re looking for a guard dog, there are many other dogs which are better suited to this task, such as the Rottweiler, German Shepherd or Bullmastiff dog breeds. How much does a Blue Nose Pitbull cost? 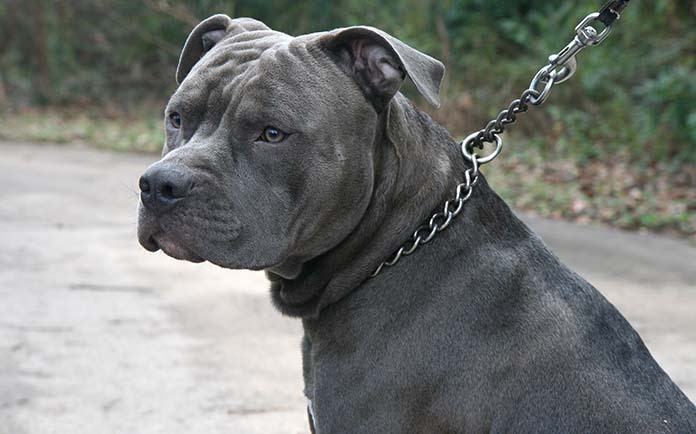 Blue Nose Pitbull can vary substantially in cost (ranges from $﻿3﻿00-$﻿15﻿,000). The variation in price mostly depends on the breeder. A poorly bred Pitbull will likely cost less than $800, and will probably come from a “Backyard Breeder” and with little or no paperwork. More expensive breeders are less likely to be interbred, and so will likely have fewer health problems throughout life. Remember, a Blue Nose Pitbull is not a specialist breed, different species or bloodline; they are simply Pitbulls exhibiting a recessive gene. Some breeders may try to convince you otherwise and use this as an excuse to charge extra. Pitbulls are one of the most common dogs in animal shelters, so I’d strongly recommend you to go and adopt one and give these dogs the loving home they deserve. This will not only help to reduce your costs (dogs leaving the shelter is fully vaccinated, neutered and dewormed) but also you'll give a chance to help and provide a home for an abandoned Pitbull. Remember, although Blue Nose Pitbulls are exceptionally beautiful dogs; don’t buy a dog just for the way it looks. Dogs are unique, sentient and loving creatures, and it is our duty to show them the care and respect they deserve. Don’t treat them as a fashion statement or some kind of luxury item. It’s important to ensure that you are fully equipped with the knowledge of looking after Pitbulls. If you’re unsure about anything, I’d recommend joining some Pit Bull forums, search and read some articles, or getting some books such as ﻿"﻿﻿﻿Pit Bulls for Dumm﻿ies﻿﻿﻿"﻿﻿﻿. This will provide you with a concise, no-nonsense guide to raising and properly training Pitbulls, ensuring they are happy and healthy. I call my blue nose pitbull “Blu”. He’s kinda blue grey in color and have expressive eyes. He’s adorable! I love Pitbulls! I’m a Pitbull Mama! Pitbulls are very loving dog. I have 2 Pits and keep me company whenever I feel alone. They are the best!